I saw these two random waffles in my freezer (they are gf/v my mom got them from the gf store but I don't know the brand. sorry!) and I decided to make chicken and waffles! It's a dish that I don't think I have ever really had before but I know a lot of people really enjoy it. I cooked the waffles in the oven along with the Beyond Meat chicken strips. I cut the figs into 8ths. Before the waffles were fully cooked, I put a bit of Earth Balance butter in each square so that it melted into the waffle. 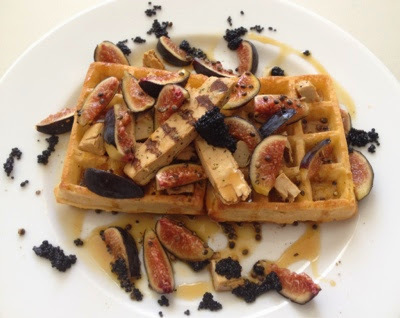 When they were ready, I plated the waffles and poured grade B maple syrup then added the chicken and figs. I thought I would add some vegan caviar (it's from IKEA and magical). It turned out to be pretty good! The caviar was a bit weird and I probably wouldn't add it next time but the waffle-fig-chicken combo was amazing!